I’ve finally done it. 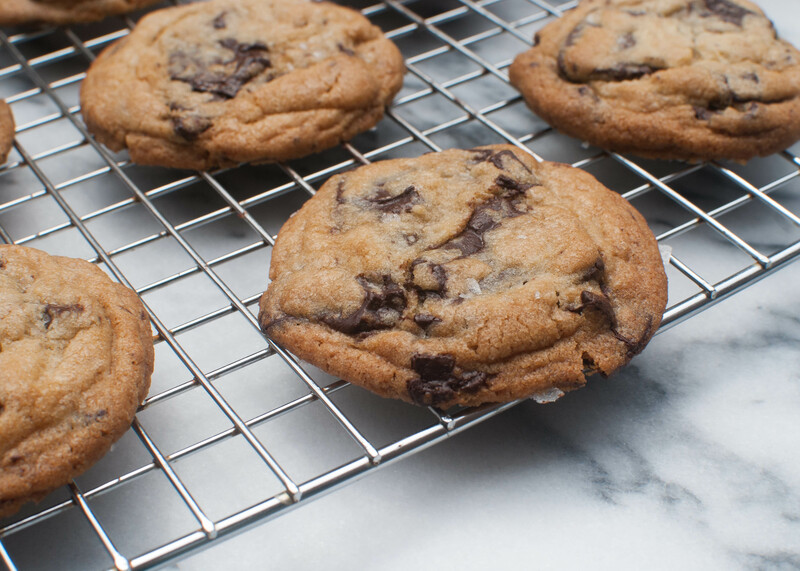 After a long (but delicious) search, I’ve found my definitive favorite chocolate chip cookie recipe. I’d tried the infamous Tollhouse recipe and one of Smitten Kitchen’s many approaches to name a few, but a few weeks ago I landed on the jackpot that is David Leite’s (aka the New York Times’) recipe. 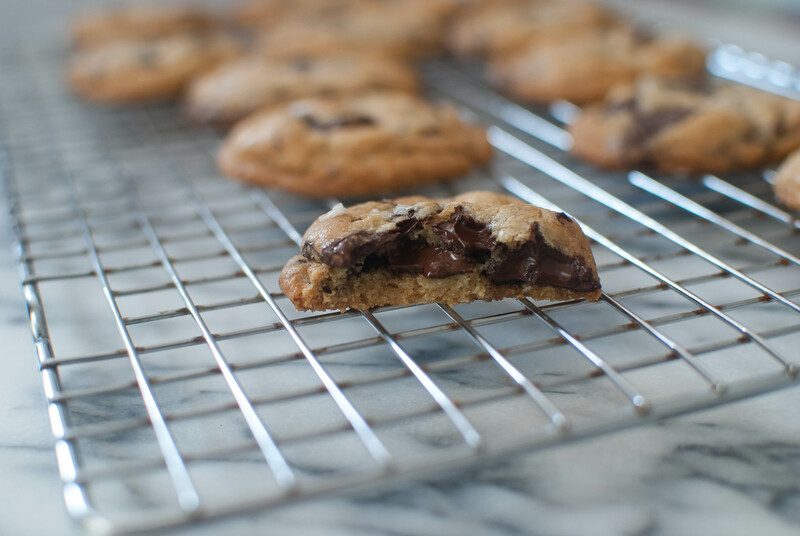 These cookies have all the right things in all the right places: that crispy edge/chewy middle quality that can be hard to come by, with seemingly colossal chunks of bittersweet chocolate that melt into gorgeous pools and a sprinkling of sea salt that sends them over the edge. Yes, I know you may be frowning at the suggested 24-36 hour rest in the fridge. Trust me, no one knows the anguish of waiting for cookie dough to chill better than I do. But try chilling your dough for a day just once and you’ll understand, I promise. The resting time improves just about everything about the finished product, from taste to texture. And about that mix of bread and cake flour that you may be groaning about? Let me just say that the combo works, and I’m not one to mess with a good thing. So go buy those extra bags of flour and clear a space in the fridge, because you need these cookies in your life. 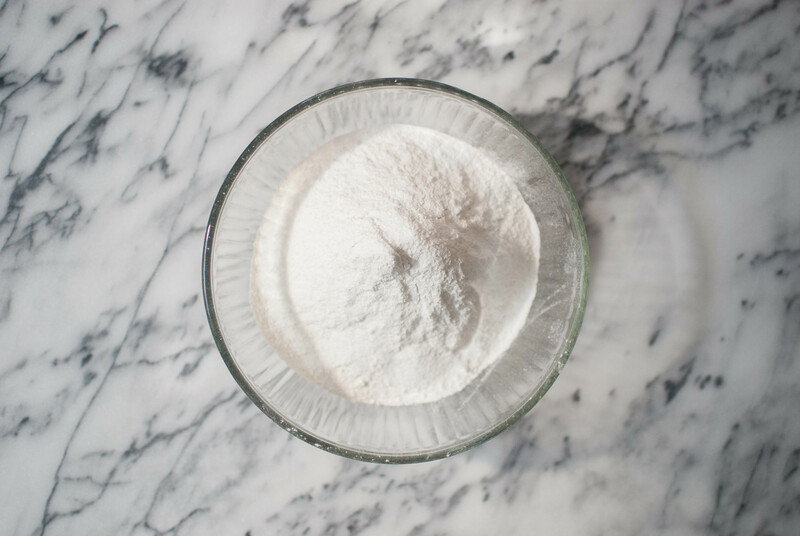 This dough starts with cake flour, bread flour, baking soda, baking powder and salt. Sift them together and set aside. Next up, cream some butter, light brown sugar and white sugar for around 5 minutes, until the mixture is nice and light. Add in a couple of eggs and then some vanilla before reducing your mixer speed to low and carefully adding the dry ingredients. Oh, yeah. It’s chocolate time. Now, the original recipe calls for bittersweet chocolate disks, but after searching 2 stores I surrendered and subbed in some good quality chocolate bars that I cut into large pieces. If the chunks feel way too big, you’re doing it right. 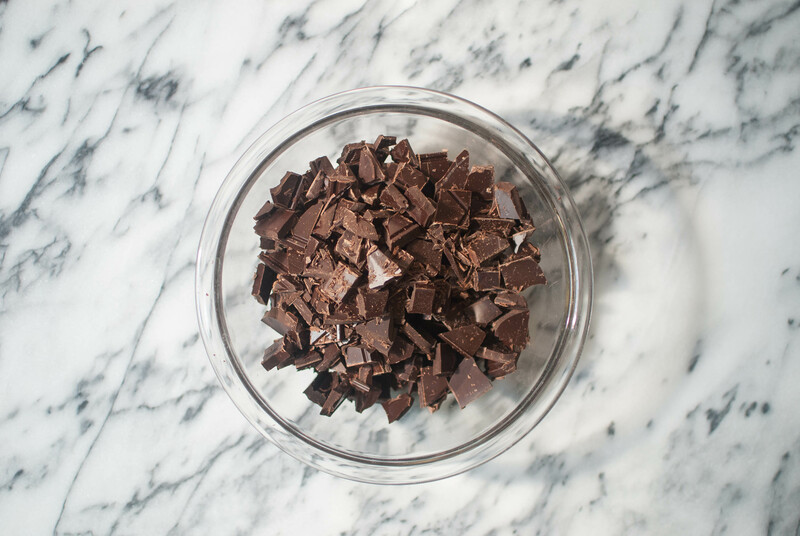 Whichever kind of chocolate you use, you’ll want 1 ¼ pounds of it. That’s A LOT of chocolate, my friends. Use a wooden spoon to stir in the chocolate (using a mixer for this will break those lovely chocolate pieces into bits). Now it’s time for that chill we talked about. 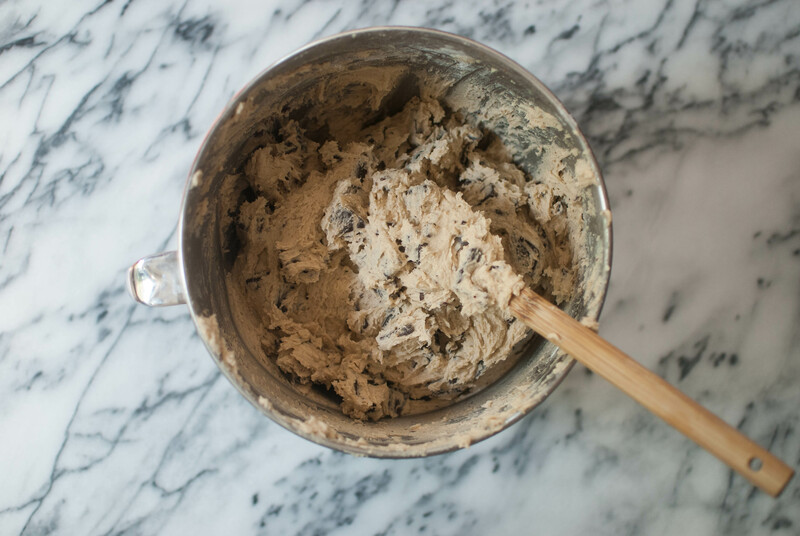 Cover the mixer bowl with plastic wrap and say goodbye to your dough for a little while. Put it in the fridge for at least 24-36 hours, or until you want to use it. Look at that dreamy dough! 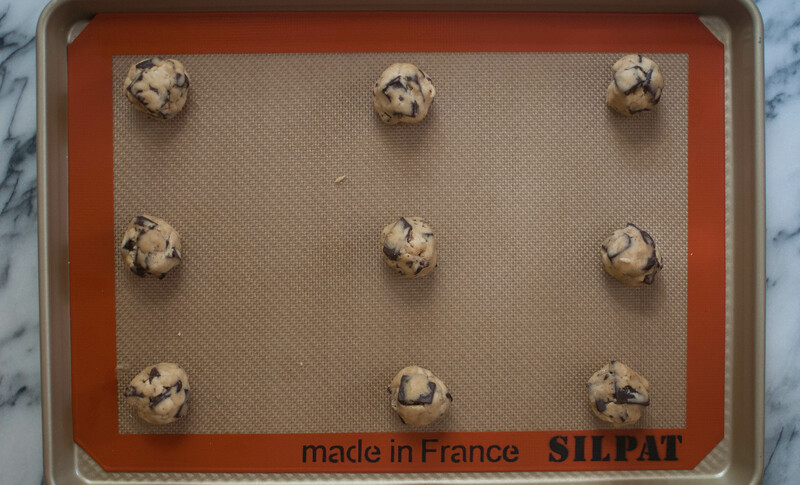 When you’re ready to bake, turn your oven to 350 F and line a baking sheet with parchment or a Silpat. 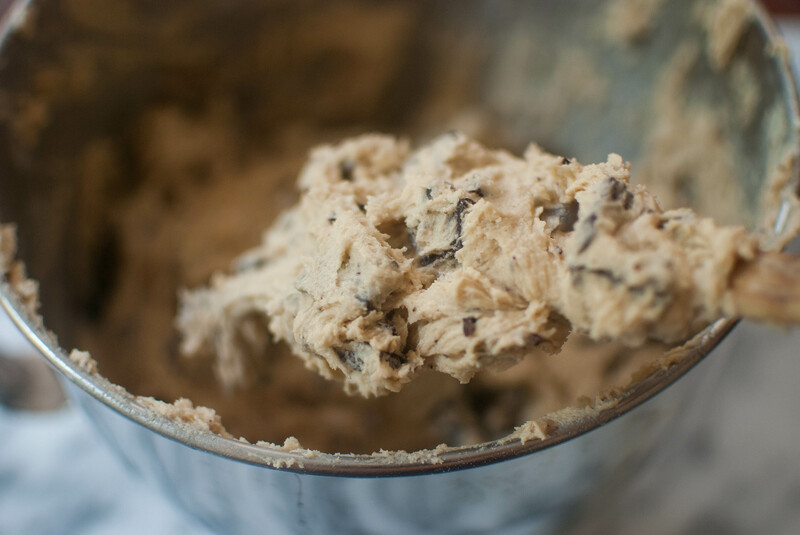 Now you have options: You can either make normal-people sized cookies by rolling 1-ounce dough balls (a medium cookie scoop works too), or you can follow the original instructions and make huge 3 1/2 –ounce cookies designed, I think, for Cookie Monster himself. But hey, go big or go home! So make your choice now; I won’t judge. 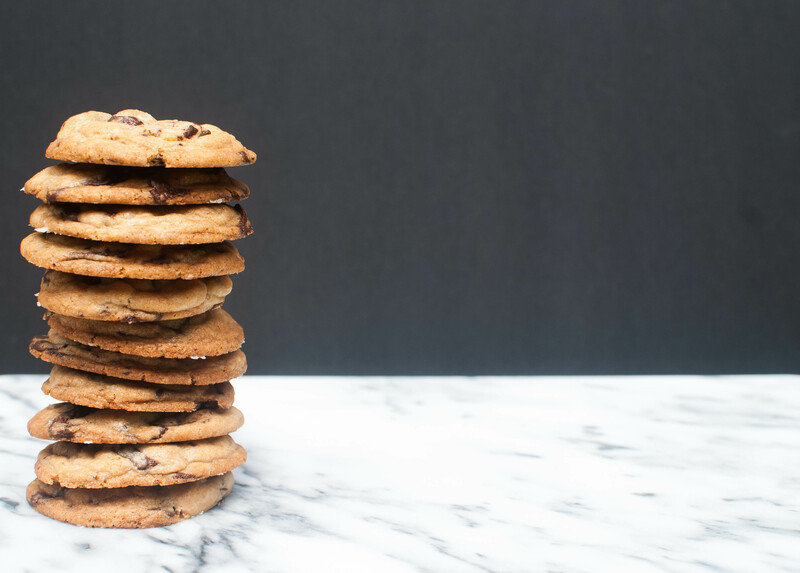 Let your cookies cool for 10 minutes before transferring them to a wire rack to cool completely. Or do as I did and devour one straight out of the oven, burning your hands and mouth on the hot puddles of melted chocolate. But first, you’ll need a glass of milk. Adorable straw not optional. Mmm. 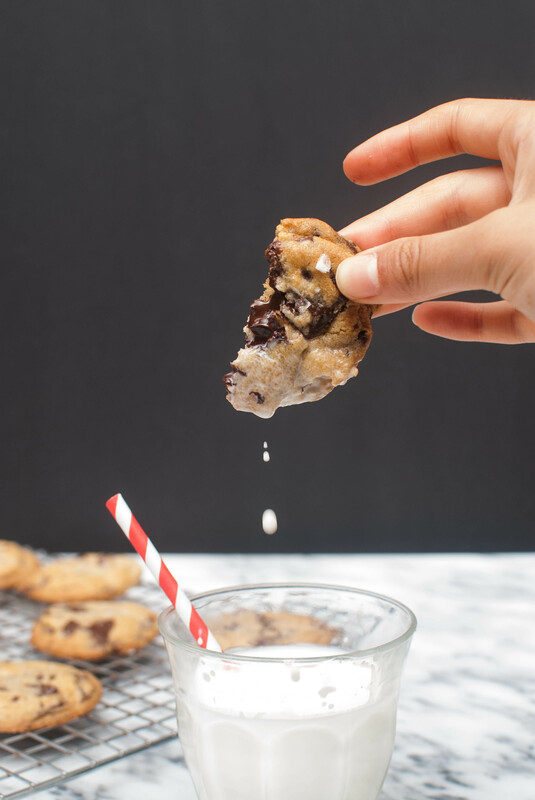 Oh, and p.s… I dunked this cookie so many times to get these shots that it ended up sinking into the white abyss and crumbling to pieces. Oh well. If you’re not looking to make dozens of cookies all at once, you can roll the remaining dough into balls and stick them in the freezer on a baking sheet until they harden back up a little, then store them in a Ziplock in the freezer and save for one of those days where you just need a warm chocolate chip cookie. To make them, bake straight from the freezer as directed but tack a few extra minutes onto the baking time! 2. In the bowl of an electric mixer fitted with the paddle attachment, cream together butter and both sugars until light and fluffy, about 5 minutes. Mix in the eggs one at a time, then stir in the vanilla. Reduce the speed to low and carefully add the dry ingredients, mixing only until just combined. Use a wooden spoon to stir in the chocolate, then cover the bowl with plastic wrap and refrigerate for at least 24-36 hours, or until you’re ready to bake the cookies. 3. 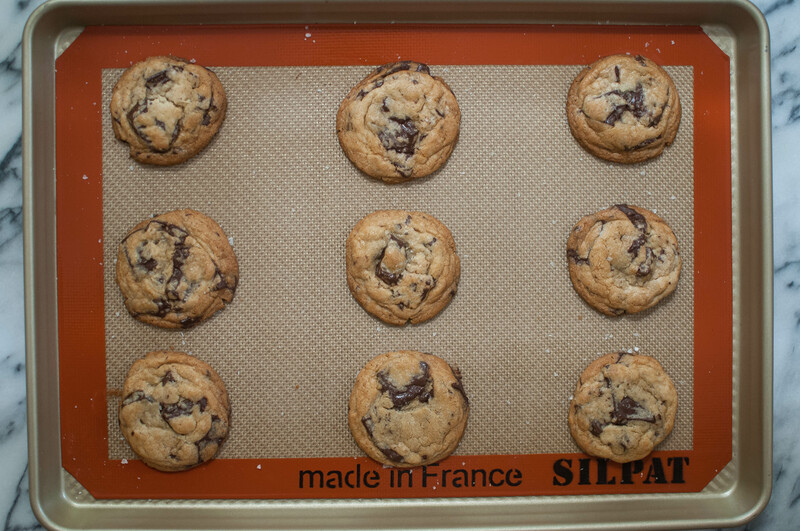 When you’re ready to bake, turn your oven to 350 F and line a baking sheet with parchment or a Silpat. 4. Roll the cookie dough into balls, choosing whatever size is your preference. I made 1-ounce balls (about the size of a golf ball), resulting in about 55-60 2 ½ inch cookies. 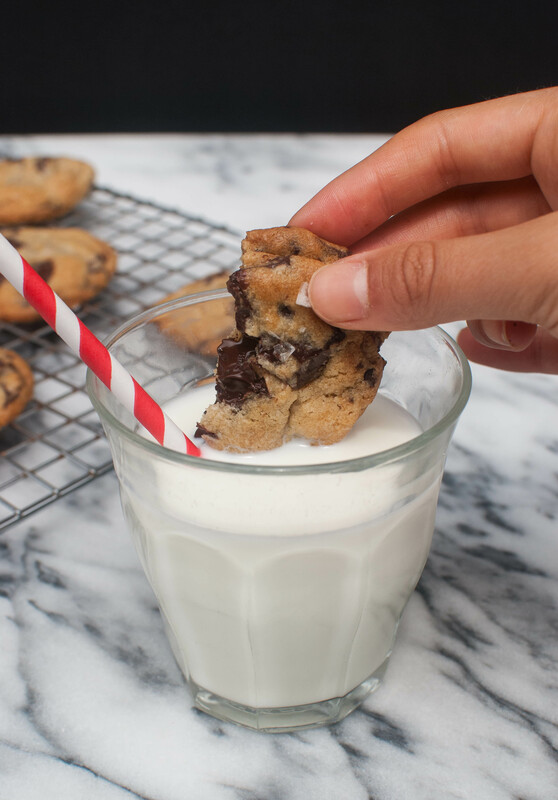 The original recipe suggests 3 ½-ounce dough balls, making around 18 cookies. 5. Bake the cookies for 12-20 minutes depending on size, or until the cookies have creases and are golden brown but still quite soft in the center. Cool for 10 minutes before transferring to a wire rack. 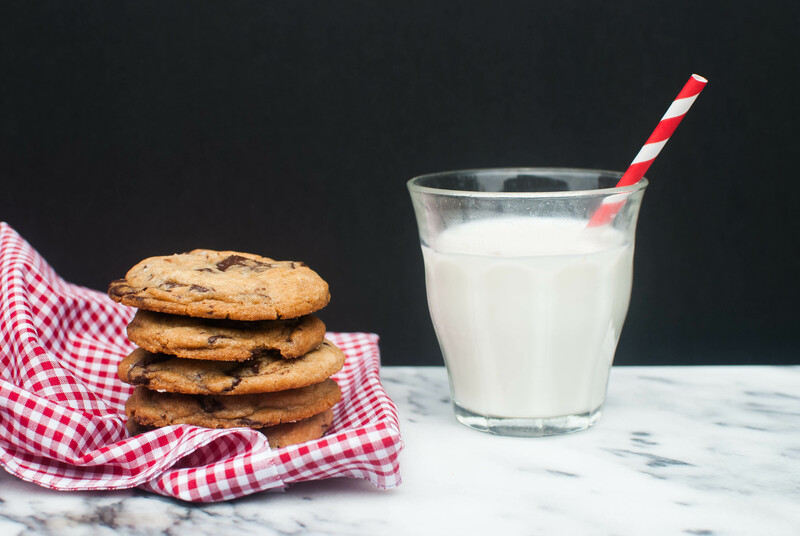 Enjoy these with a big glass of milk, and make sure there are napkins on hand! Try these, my friends. Your life will never be the same. Happy nibbling!